What was America thinking? Donald Trump as our president? You’re kidding, right? No, a nightmare is upon us. But take heart. Vermont will fight back. Life in Vermont is already “great.” We’ll be damned if we’re going to let a man who dyes his hair, cheats workers and has his products made in China, dictate to us how life should be. Trump may see himself as a western version of Vladimir Putin, but we don’t agree. He’s just a bully used to stiffing banks (Vermonters make their payments), stiffing his subcontractors (we pay them, because we’re related to most of them) and treating women poorly (we just know better). We love a good fight, and those who challenge us soon learn that Vermont generally wins. With the help of a score of Vermont writers and artists, our original literary duet became a chorus of intelligence, wit and passion. 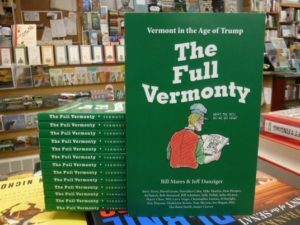 In addition, the book has quizzes, relevant quotations from Vermont history, escape literature, a Vermont tool box, and more. Indeed, this book has all things necessary to flesh out a thump to The Trump! 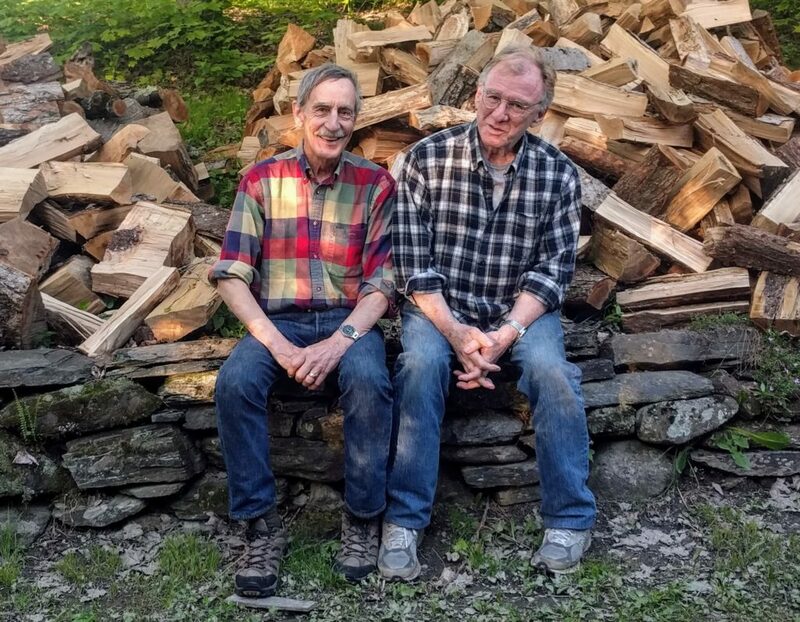 Authors Bill Mares and Jeff Danziger at Danziger’s woodpile in Dummerston, Vermont. Raised in Texas, educated at Harvard, Bill Mares has been a journalist, a high school teacher and a member of the Vermont House of Representatives. 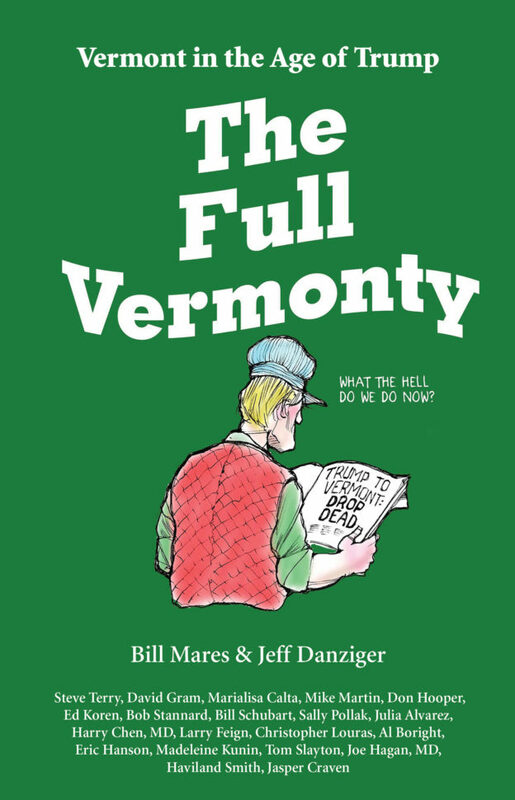 He has authored or co-authored 15 books on subjects ranging from the Marine Corps to workplace democracy to Presidential fishing, plus four books of humor with Prof. Frank Bryan, including the best-seller, Real Vermonters Don’t Milk Goats. His hobbies include running, beekeeping, singing and fly-fishing. He lives in Burlington, Vermont with his wife of 45 years, Chris Hadsel. They have two sons. Jeff Danziger lives in New York City. He is represented by CWS Syndicate and the NY Times Syndicate. He is the recipient of the Herblock Prize and the Thomas Nast (Landau) Prize. He served in the US Army in Vietnam and was awarded the Bronze Star and the Air Medal. He has published eleven books of cartoons and one novel. This week, the Brattleboro-based Green Writers Press is rolling out the title, for both a state that gave the businessman candidate a national-low 30 percent of its vote and for like-minded readers coast to coast. The 134-page paperback features 20 collaborators ranging from Weybridge writer Julia Alvarez and Brookfield artist Ed Koren to former Gov. Madeleine Kunin and Vermont Life editor emeritus Tom Slayton. Parson Weems & wherever books are sold.